St. Louis Park was settled by stern-eyed New Englanders who probably didn’t approve of dancing. But come the 20th Century, dancers were springing up (as it were) and after World War II, there was a tremendous need to teach dancing to the children who were flooding into town. Fortunately, there were many opportunities to learn to dance. The following is a list of just a few – if you have another to add, please contact us. Micki Carlisle began her dancing in Minneapolis at the age of 14 – in the Roaring Twenties – to bring in money for her family. She performed towards the end of vaudeville, then moved to New York City in the 1940s, where she got her big break doing a Spanish dance. After a busy career in New York, in the 1950s she returned to the Twin Cities and made her home in St. Louis Park. Back in town, she danced at Curly’s nightclub and started a dance studio with friend Dorothy Lewis, a famous ice skater. The MickRae Studio on Penn Ave. was the site of parties that featured guests like Liberace (who once made hors d’oeuvres). In her 60s, Micki started the Satin Dolls, a group of tap dancing seniors who perform throughout the Twin Cities. Micki died on July 30, 1994 at the age of 76. 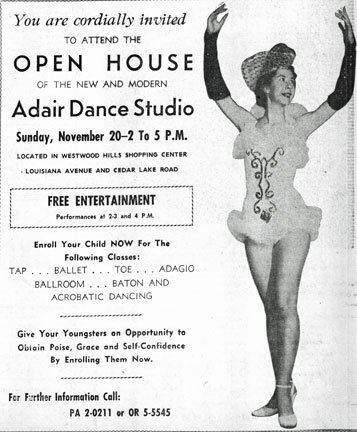 The Verna Golden Dancing School operated out of 4108 Xenwood in 1947. Dorothy Henry was an internationally famous dancer who came to the Park in 1946, first in the Park Theater Building. In 1966 she built a home studio at 4200 Yosemite Ave.
Emma Henry (apparently no relation to Dorothy) had a studio at 1460 Jersey in 1958. Her husband would pick up students in his station wagon and take them to lessons. She taught learned baton, acrobatics, ballet, and tap. She had her students in the Hopkins Raspberry Festival parade every year, dancing to the song “Dance With me Henry.” Wendy King sent in a recital program dating sometime between 1968-1971. In 2013 Emma celebrated her 100th birthday. Jazzercize by Judi Sheppard Missett was held at Torah Academy, 2800 Joppa, 1987-88. In 1952 Joyce Studios, located at 4100 Excelsior Blvd., taught tap, acrobatic, and ballet dancing. In January 1953, one could take a course in Creative Dramatics. The classes, geared to ages 6-14, were taught by Dorothy Zieske and Clara Turngren. From at least 1965-75, Miss Louise Johnson, assisted by her daughter Melinda, taught dancing in her basement studio at 3145 Idaho Ave. Here’s some adorable students at a recital in the mid 1960s performing at Central Jr. High. Photo courtesy Laurie Wolfe Grimm. On November 5, 1951, the Lundstrum School of Dance and Modeling (23 years of experience) opened at the American Legion Hall. The Gretchen Palen School of Dancing, featuring tap, ballet, acrobatic, and baton, was located at 3925 Yosemite beginning in October 1949 until at least 1953. Palen was married to Minnesota Supreme Court Justice Carl Donald Peterson and apparently moved to Edina. Her daughter Barbara Peterson served as Miss Minnesota and was Minnesota’s first Miss USA in 1976. On October 1, 2012, the Park Dance Center opened at 6900 Oxford. Its owner and director is Gretchen Vandeputte. Classes include ballet, tap, jazz, hip hop, acrobatics, fitness, and yoga. Vandeputte has worked in the area for more than 12 years as a gymnastics coordinator and coach through the St. Louis Park Public Schools. Park Dance Studio advertised at 8108 Minnetonka Blvd. (Texa-Tonka Shopping Center) in the 1955 Echowan. In 1959-60 the Maxine Raver Suburban Dancing School was located at 2066 Flag, and also offered classes in adult figure control. Evelyn Renner advertised Ballroom Dancing, “Taught Privately or by Class in my home” in the January 19, 1953 issue of the Park High Echo. St. Louis Park Senior High offered dancing classes starting in 1944. In 1951 the instructors were Mr. and Mrs. David LaVay. Mrs. Salloway’s was on 27th and Kipling. Not exactly dancing, but in October 1959, the Echo advertised Benita’s courses in charm and self-improvement. “Want to be more attractive? Learn visual poise, wardrobe, make-up, etc. Mrs. Robinson, 2808 Jersey. $2/hour. See also Premiere School of Self-Improvement and Professional Modeling, Inc.